We’re on a Minion craze here in the Jenny household! 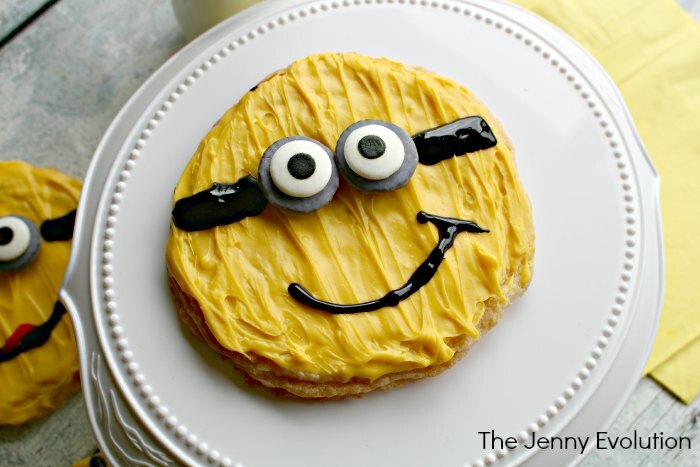 This week, we’re making minion cookies! Oh, but there aren’t just any cookies — melt-in-your-mouth sugar cookies. Want even more minion inspiration? Visit my Minion wrap-up, where All Things Minion reside. 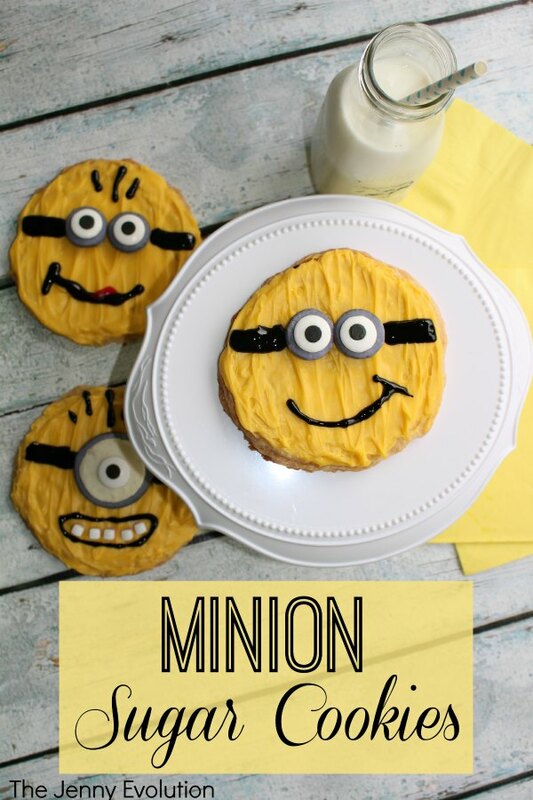 This recipe will make 8 large minion sugar cookies. Enough to share with the whole family! Preheat oven to 375° degrees. In a small mixing bowl, add the flour, baking soda and baking powder. In a medium mixing bowl, cream the butter and sugar until light and fluffy. Add the egg and vanilla to the creamed butter and mix for one minute. Gradually add the dry ingredients and mix until well-incorporated. Using a jumbo-sized cookie scoop, form 8 balls out of the dough and place on parchment-lined cookie sheet. Bake for 10 minutes or until light golden brown. Cool for at least 2 hours on a wire rack. Melt ½ cup of the yellow Wilton candy melts in the microwave for 60 seconds. Stir until completely melted. Spread the melted candy on each sugar cookie and let cool for at least 1 hour. Melt ⅓ cup of the white Wilton candy melts in the microwave for 60 seconds. Stir until completely melted. Add a small drop of royal blue and black food gels into the melted white candy mixture and stir until a grey color is achieved. Separate a large Oreo cookie and dip the piece without the creme filling on it into the grey icing and cover completely. (Keep the piece with the filling for later). Cool on wax or parchment paper for at least 1 hour. This grey cookie will be the base for a large minion eyeglass. Separate 2 small Oreo cookies and dip the pieces without the creme filling into the grey icing and cover completely. Cool on wax or parchment paper for at least 1 hour. These small cookies will be the base for minion eyeglasses. Attach a large grey Oreo cookie in the center of a sugar cookie with a dab of melted icing. Gently remove the Oreo creme filling from the saved piece and place on the large silver Oreo. Place a large candy eye in the middle of the creme filling on the large silver Oreo. Add the sides of the glasses and the mouth with a tube of black icing gel. Optional: Cut a small piece of a red fruit roll up to resemble a minion tongue. The white cube sprinkles can be added for teeth. Add pieces of hair strands with the black food icing. Repeat steps 14 thru 19 using the mini Oreos and 2 candy eyes for each minion head. Let dry for at least 2 hours (icing gel will smear if you do not let it dry for 2 hours). Awesomely cute cookies. Love the yellow fellows 🙂 Pinned! I’m having a total minion crush! Can’t wait to take my boys to the movie. 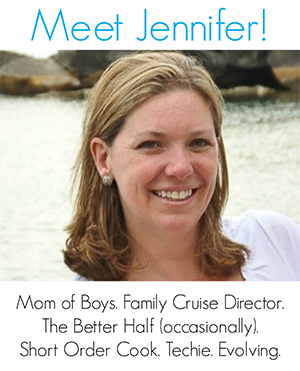 Super cute, Jenny! I’ve been seeing so many minion-related party decor and food posts that I’m half tempted to use that theme for my son’s 2nd birthday party even though he has no idea what a minion is. Haha. Love the cookies~! Oh that’s hysterical! He’d probably love the fun of them. Love the minion cookies! Those candy melts are so fun to work with. Stopping by from the SITS linkup. Thanks for posting something so cool yet simple to make. Very cute and just at the right time! Thanks for sharing with the Thursday Blog Hop! Your Minion Cookies came out adorable. Thank you for sharing the Cookie recipe. Thanks for sharing at the Inspiration Spotlight Party. Pinned & shared. Hope to see you again soon. These are adorable cookies, and a great tutorial! Thanks so much for sharing with Full Plate Thursday and hope to see you again soon. Thanks! Even without the minion decoration, these cookies are delish! Those turned out great! Thanks for sharing at the Merry Monday Link Party! Cute cookies! Thanks for sharing at the What’s for Dinner link up! 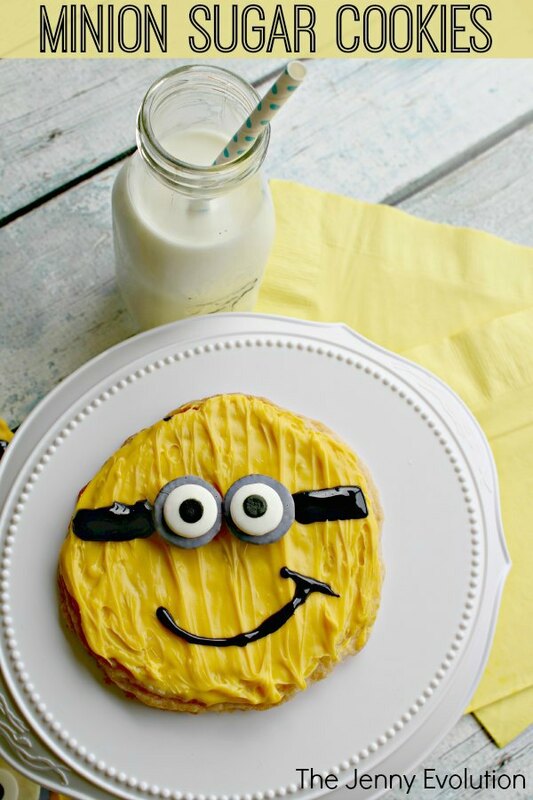 How cute are these minion sugar cookies! Thank you for sharing at Happiness is Homemade link party. Shared and pinned. Love these! While there are no kids in my household my husband and I are all about minions! These cookies are so cute! Glad to have found you on Fiesta Friday! Your post is featured on Full Plate Thursday this week and thanks so much for sharing it with us,we have pinned your post to our Features Board. Have a great week and come back to see us real soon!